In Our Promised Land, Michael T. Darkow introduces us to two families: the Jewish Liebowiscs and the Palestinian Assads. After spending much of his young life in a Nazi concentration camp, Ellie Liebowisc arrives in the new nation of Israel where he vows to ensure his family and other Jews did not suffer in vain. At the same time, Yasif Assad and his family are displaced from their ancestral home to make room for the Jews. They are two men with two vastly different experiences when Israel is formed, but both experience much violence and pain as they struggle to find happiness and peace within themselves. I haven't taken the time to read much about the Israeli-Palestinian conflict and its history in the past, so I learned a lot about the basic reasons for the formation of Israel, and the comfort and pain it caused. By showing the story through the eyes of two men living through it, Darkow brought out the humanity on each side of the conflict, helping me understand and respect their positions. The book provides some hope for peace, but it's hard to imagine how this will be possible with such a violent history and so many strong emotions that run so deep. 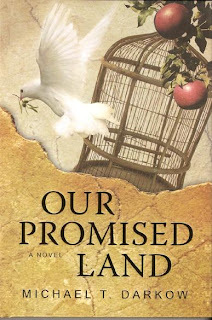 At just 162 pages, Our Promised Land was a quick and easy read, but it was also incredibly moving. Darkow's development of the characters of Ellie and Yasif was excellent, but he also brought depth to many of the other characters, despite the short length. I especially enjoyed the connection he made to the conflict in ancient times, and the way members of one family can have such different perspectives on life. According to the book jacket, Darkow "strives to open a dialogue on issues of peace and mutual understanding." I think this is an honorable goal and hope that he is successful. I highly recommend Our Promised Land. This review was written based on a copy of Our Promised Land that I received from Maia Levenson at Phenix & Phenix Literary Publicists. Looks like an interesting read, either for me or my FIL. Sounds really interesting. I'd love a sneak peek. I'd like to be counted for this book which sounds interesting. I wish you and your readers much happiness and great joy!!!! Please enter me - sounds great! My bad posting on the wrong blog! OOPS! Count me in! I didn't blog, but I am going to tweet w. the new link ... sorry!! !